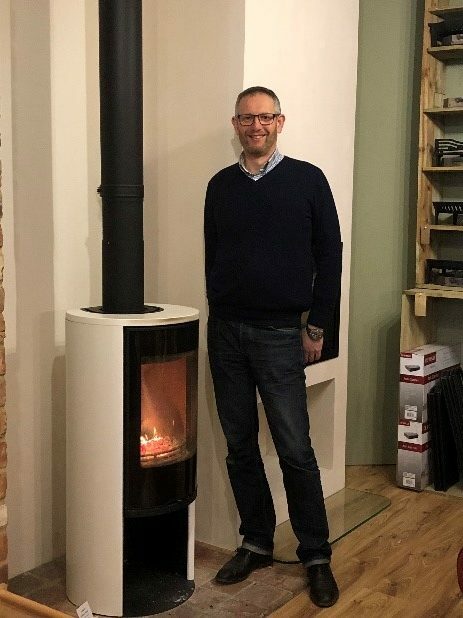 10 years ago, whilst working for a large builders merchant, Simon Attfield became aware of the growing demand for a bespoke wood burning stove company in the Banbury area. The owner of a similar business had recently retired and Simon, who was then in his early forties and with a young family, decided to take the plunge. It was 2008 and against the backdrop of a country in recession he took premises in Beaumont Road, Banbury, built, decorated and fitted out the showroom himself with a huge amount of help from friends and family. Simon knew his key to success would be the quality of his stoves. Many stove suppliers were falling over themselves to have their range in Simon’s new showroom but the ‘stand out’ brand was ‘Clearview’. Just one snag – Clearview very rarely give out new dealerships and especially to new businesses. To cut a very long story short, the owners of Clearview got to know Simon, his wife and their commitment to providing a top-quality product and service. The dealership was awarded to Iron and Wood in 2008 and Simon opened the doors of Iron and Wood on 29th January 2009. The business has since gone from strength to strength, in no small part to the superb staff who have joined the company, many of whom have been with Simon since the beginning. Szab Kata originally came on board as a fitter and has, over the years, become a core part of the business. Following the success of Iron and Wood, we opened our second branch in Kidlington in 2017 expanding the area we cover to include Bicester, Witney, Woodstock, Oxford and the surrounding villages. Simon and Szab continue to drive the company forward with expanded ranges and a commitment to provide the quality of service only found in a traditional, owner run business. In fact, this year, Simon has been nominated for the Small Business Award as part of the Cherwell Business Awards.